*TT RGB PLUS App will support Riing Trio Series from the fourth quarter of 2018. *TT AI Voice Control will support Riing Trio Series from the end of Q3 2018. *DO NOT connect Riing Trio fans to other TT RGB PLUS controllers. Riing Trio 14 continues the high static pressure fan design of Thermaltake Riing Series. The CFM of Riing Trio 14 fans is 60.68 that is equal to 103.09532 m3/h. In other words, the air volume that the fan can exhaust per hour can fill up 933 pieces of super tower chassis. 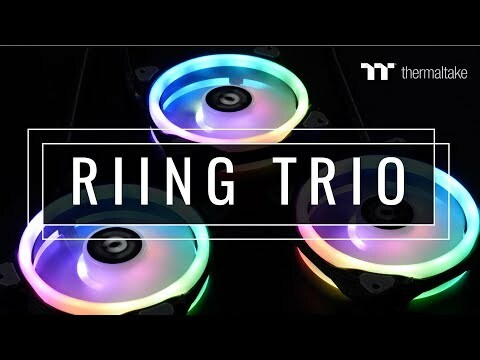 In the video, you can clearly see the superiority of the high-performance Riing Trio fans. Featuring 30 addressable LEDs (front: 12; middle: 6; back: 12), great light coverage, and uniform color and brightness, the built-in LED ring can paint your build with 16.8 million colors. Features • Three individual addressable LED rings. • Patented 30 LED ring & Software design. • Supports up 16 controllers, maximum 80pcs fans. • 16.8 million colours RGB spectrum. • High static pressure fan design for radiator cooling. • Long life hydraulic bearing for reliable and silent operation. • Patented TT RGB PLUS Software & App. • Thermaltake AI Voice Control. • The World’s 1st Three Independent 16.8 Million Colors LED Ring Design.